Conference of Presidents honored at a 70th-anniversary celebration at the Israeli Embassy in Washington. 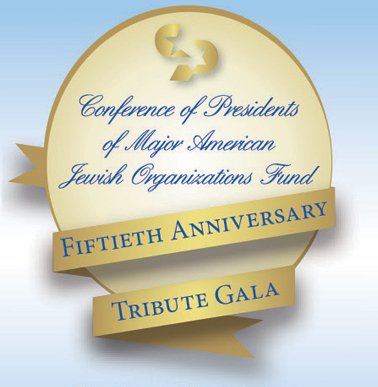 The Conference of Presidents was designated to receive a 70th-anniversary award recognizing the contribution of American Jewish organizations to Israel, the US Israel relationship, and strengthening of ties between the peoples of the two countries. Among the 70 honored were those who assisted Israel from its earliest years until the present day. Vice President Pence joined the commemorative event in celebration of Israel’s independence. March 3, 2017 New York, NY - - This morning, leadership from the Jewish community met with FBI Director Comey and the senior leadership team of the FBI to discuss the range of threats that have been directed against Jewish institutions in the past two months. The conversation encompassed the current situation and potential strategies for future collaboration. All the organizations in attendance expressed the deep gratitude of the entire community for the extraordinary effort that the FBI is applying to the ongoing investigation. New York, NY, January 25, 2017 … The Conference of Presidents of Major American Jewish Organizations today congratulated Ambassador Nikki Haley on assuming the post as Permanent Representative of the United States to the United Nations. New York, NY, January 20, 2017 . . . Stephen M. Greenberg, Chairman and Malcolm Hoenlein, Executive Vice Chairman and CEO of the Conference of Presidents said, “We congratulate President Trump and Vice President Pence on their inauguration and wish them well as they begin a new era of leadership for the United States of America. The transfer of power to the new administration is in keeping with the America’s traditions and our democratic process. December 30, 2016, New York, NY . . . Leaders of the Conference of Presidents of Major American Jewish Organizations today called on President Hollande of France to cancel or, at least, postpone the international meeting on Middle East Peace scheduled for January 15, 2017 in Paris, calling it ill-conceived, poorly timed and damaging to prospects for peace. December 23, 2016, New York, NY... Stephen M. Greenberg, Conference Chairman, and Malcolm Hoenlein, Conference Executive Vice Chairman and CEO, expressed their deep disappointment and rejection of the United States' abstention on the anti-Israel resolution the United Nations Security Council. “There is no justification or explanation that validates the United States failure to veto the one-sided, offensive resolution adopted by the Security Council today. Conference of Presidents Welcomes Postponement of Security Council Vote on One-Sided Palestinian-Israeli Resolution New York, N.Y.
New York, N.Y., December 22,2016 . . . Leaders of the Conference of Presidents of Major American Jewish Organizations today welcomed the decision to postpone consideration by the Security Council of a one-sided condemnatory resolution on the Palestinian-Israeli issue.